Morristown, N.J. — Louis Berger, a global infrastructure engineering and development firm, together with the municipality of Humacao, Puerto Rico, hosted a special event on Thursday, June 7 celebrating the launch of a pro bono project to restore power to Casa del Amparo Nursing Home. It is one of the most affected areas close to where Hurricane Maria made landfall and part of the 1 percent of the island that remains without power. 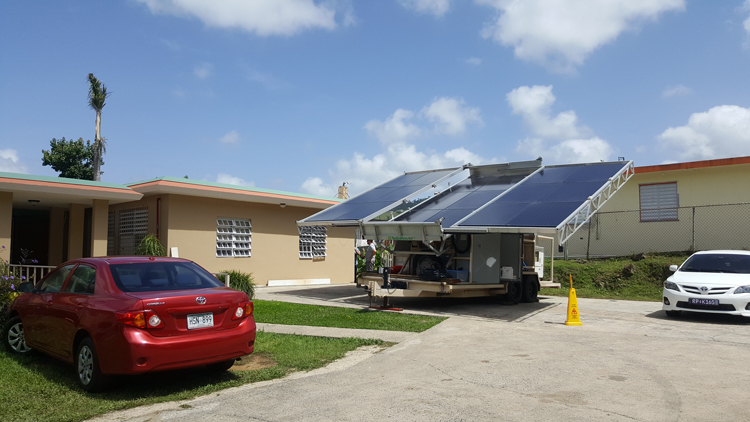 The firm installed a Westgen Hybrid Mobile Solar Generator. Casa del Amparo has 23 residents, nine of whom are disabled. Other elected officials who attended the presentation include Mayor Marcelo Trujillo and other mayors of nearby municipalities, central government officials, families of the residents, community leaders and members, and more. This is the second joint effort by Louis Berger and its partners DC Solar, AEG and WestGen, to evaluate and promote sustainable and resilient infrastructure solutions in Puerto Rico. The objective of the project, implemented at no cost to local residents, is to demonstrate distributed, solar hybrid power technologies while restoring residents’ access to fundamental services that would otherwise not be available until the central power grid is fully restored. In addition to improving the quality of life of the community, this pro bono project is part of an effort to raise public and private sector awareness of the benefits of cleaner, distributed, mobile and resilient energy solutions. Especially in storm-prone communities, distributed power generation provides advantages over reliance on a centralized grid alone. The project will continue until the central power grid is fully restored. Since Hurricane Maria devastated Puerto Rico, Louis Berger, in partnership with its clients, has been prepping, hauling, and installing 2,320 emergency generators at schools, pump stations, hospitals and other critical facilities on the island. Due to this unprecedented generator usage and extended duration of the mission, generator repair has become a crucial portion of the Temporary Power Mission. The company also has deployed more than 1,000 staff and independent contractors in support of the Federal Emergency Management Agency (FEMA), U.S. Army Corps of Engineers (USACE), U.S. Postal Service, and Defense Logistics Agency bringing much-needed manpower, equipment and supplies to the island’s 3.4 million residents. Louis Berger has a long history of supporting communities in their recovery and rebuilding efforts following major disasters, including in the Philippines, American Samoa, and in New York and New Jersey following Superstorm Sandy.